Any country with access to the sea, to protect its borders and national interests should not only army but also Navy. A strong modern Navy is a measure of the level of development, possibilities and importance of the state. With such a country considered by other States. And who now has the strongest Navy? Currently, the most powerful fleet include the United States of America. During the "cold war" military-Maritime fleet of the USSR of the force were closer to the us (and in some classes of warships even ahead). But after the collapse of the Soviet Union and the years of subsequent economic difficulties of the Navy of Russia, the legal successor of the Soviet Union was much weaker than the us. In the US Navy consists of approximately 600 warships. The main striking force of 10 aircraft carriers with the nuclear power plant, many dozens of missile cruisers, destroyers and frigates and nuclear submarines type "Ohio", "Los Angeles", "Seawolf", "Virginia", part of which is armed with Intercontinental ballistic and cruise missiles. Now in the final stage of the construction is the nuclear aircraft carrier "Gerald R. Ford". The planned construction of at least another one of the same ship. No country in the world at the moment has no Navy that could get in the US Navy. For example, the United Kingdom, until relatively recently, bearing the proud nickname, "mistress of the sea", now has only one aircraft carrier "invincible", to be written off in the current year, several submarines, frigates and destroyers (not counting minesweepers and patrol boats). Compared to the once gigantic "Royal Navy" Royal Navy, plied all the seas and oceans, it is a very small force. 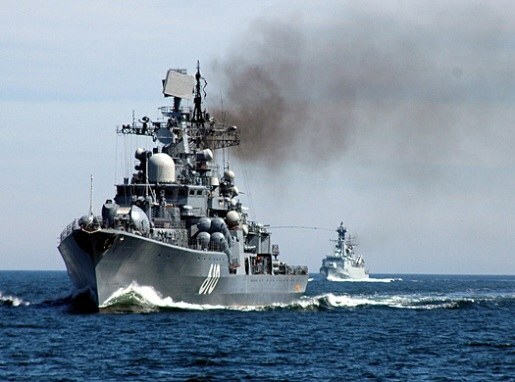 The composition of the naval forces of the Russian Federation consists of 4 fleets (Baltic, black sea, Northern and Pacific) and the Caspian flotilla. The most powerful surface ships – the heavy aircraft-carrying cruiser (TAVKR) "Admiral Kuznetsov", which can carry air group of 50 aircraft and helicopters, as well as the heavy nuclear missile cruiser "Peter the Great". Impact of a cruise missile, which is armed with "Peter the Great", capable of hitting targets at a distance of up to 550 kilometers. In the part of the naval fleet has a missile cruiser, large and small anti-submarine ships, many nuclear submarines, armed Intercontinental ballistic missiles and cruise missiles and torpedo carrying weapons. Thus, the Russian fleet, though greatly inferior to the us, is a formidable force.